What Do Roofing Inspections Achieve For Homeowners? Broken scuppers, or incorrectly placed scuppers that do not properly drain water away from the house. Cracked tar paper can allow water to slowly work its way down and erode the wood. Over time, a roof inspector may see the damage grow to a degree where the intake of water ina downpour is substantial. 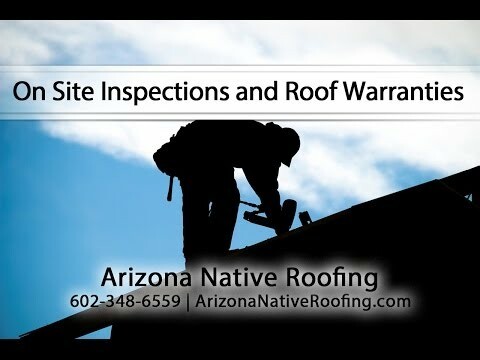 When getting a Tempe roof inspection, make sure that the contractor inspecting your roof tiles is a qualified and licensed contractor, and is in good standing with the Arizona Registrar of Contractors. It is also important to be sure that whatever persons work on your roof, they are insured for working on top of your house. The last places to look will be Google places reviews, service magic reviews, yelp, etc… Make sure your inspector is competent!! Of course, new home buyers would be well advised to have their roofs and attics inspected for water tightness prior to closing on a property. Homeowners who’s roofs are more than 10 years old would be well advised to have inspections every few years, so that when replacement is needed the work can be done before water damage strikes. When your home is in need of a quality Arizona roof inspection to check for repair needs, or for an appraisal on a roof replacement, the experienced Arizona roofers at Arizona Native Roofing have you covered. Our certified, licensed, and insured company will help you with the roofing process, from start to finish. Whether you live in Goodyear, Peoria, Mesa, or another Arizona community, we can help. Contact us today to learn more about our Arizona roofing inspection services, or to schedule an appointment.